Raise your hand if you have days where you’re way too busy to cook a full course meal, but still want to eat a healthier homemade meal. Everyone? Okay. 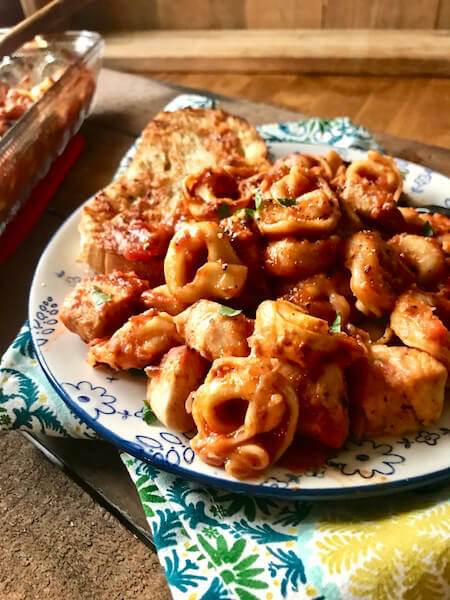 Honestly, the name, Cheesy Chicken Tortellini completely speaks for itself here! This dish is super quick, easy, and delicious. Three of my very favorite things when life gets a lil’ crazy. I’ve made this about 12 times in the past couple months and I’ll tell ya what.. It hits the spot. Every. Single. Dang. Time. It’s simple. It’s delicious. Every other time I make it Pepper eats all of it up including the chicken. The other times she eats only the tortellini. So, I call that a win! I’ve made this multiple times where I’ve added different veggies which adds some delicious texture and a whole bunch of nutrients. I think out of the few I’ve tried we preferred zucchini the most. When I went to photograph this, I went the grocery store to grab a few ingredients one of which was zucchini and they looked sad. Very, very sad. So, I decided to spare you and my family of those very sad lookin’ zucchinis and just omit them this time around. Eric would tell ya that it needs mushrooms, but that’s like a curse word in my kitchen so I’d fling those suckers out the door before they went into this delicious bake. 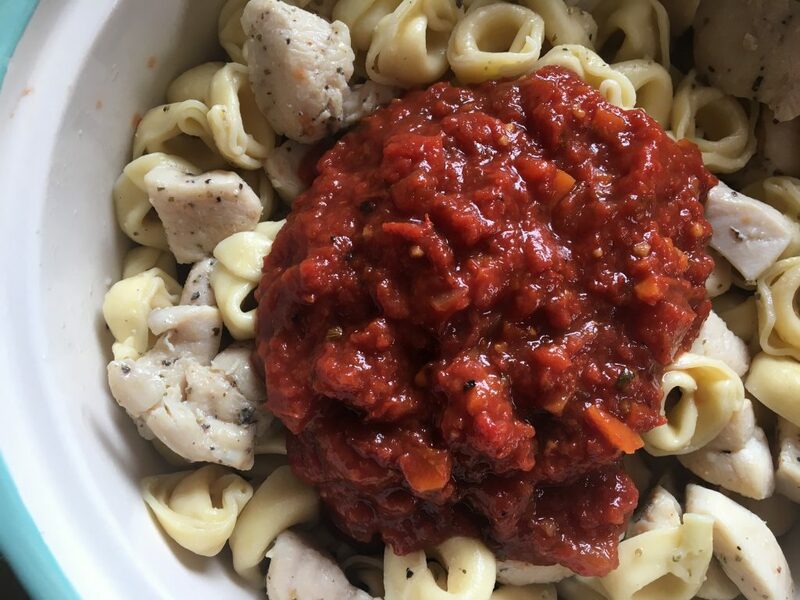 This meal calls for one of my most popular, most versatile, and easiest recipes *drum roll* Crock Pot Marinara! It’s basically kind of like the most popular girl in high school type of recipe. It’s oh so good! If you haven’t tried it. Do yourself a favor and make it! If you just don’t feel like making it though, I understand. We’ve all been there. 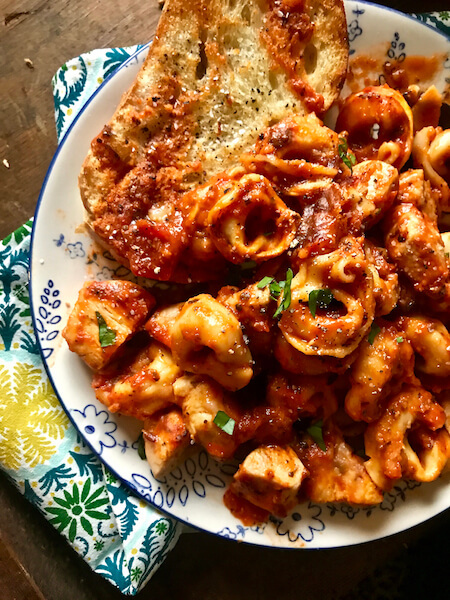 Try to use a higher quality and/or your favorite jar of marinara as that’s where bunches of the flavor is in this recipe. 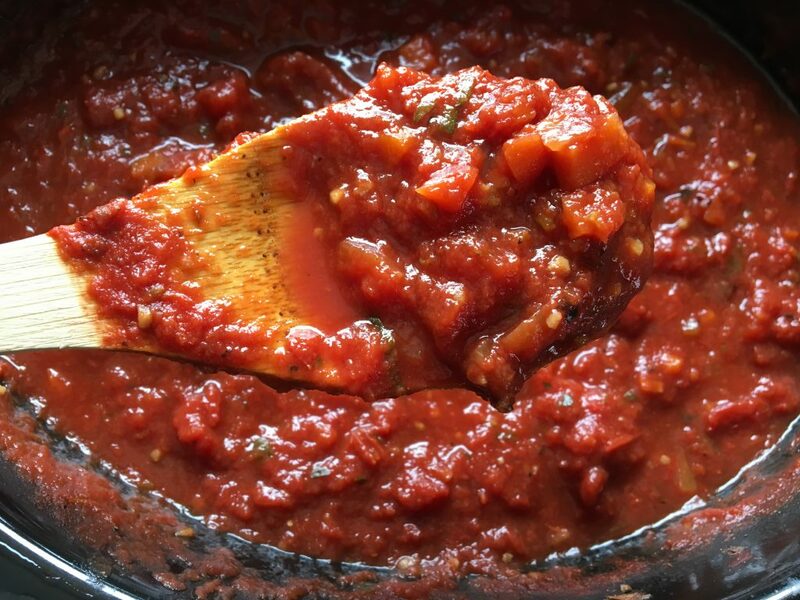 Be mindful that the points/calories are figured for my crock pot marinara which happens to be zero smart points/points plus for any amount and about 25 calories per half cup. I made a fresh batch of sauce and my house smelled like a little Italian eatery. It was divine. You’ll need this stuff. Or you’ll need some jars of the stuff. Either one works, but I’m a little biased and I prefer homemade marinara. You can find the recipe for this here. 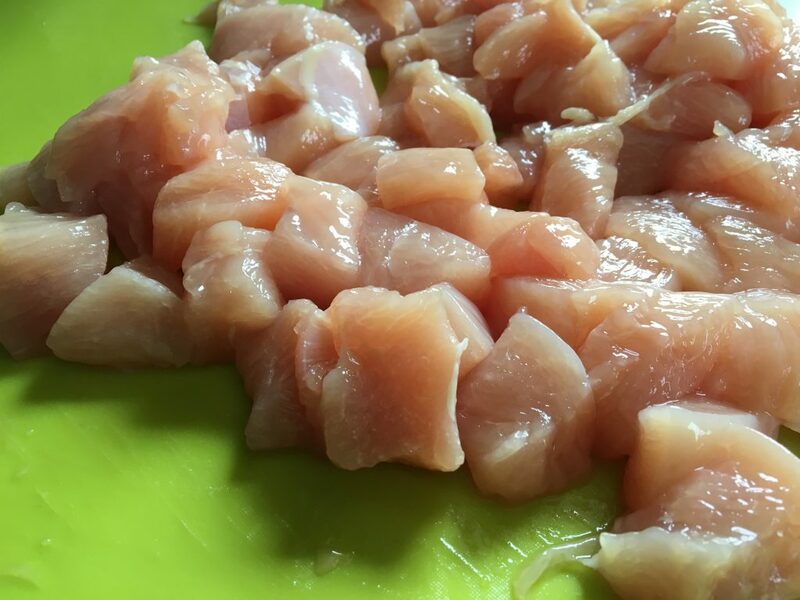 You’ll need some raw chicken breast and you’ll need to cut it up into even “bite size” pieces. I love taking pictures of raw chicken probably just as much as you love lookin’ at them. Trust me. Ha! It’s part of the process. In a large skillet heat a couple teaspoons of oil then throw in the chicken. Generously sprinkle some salt, pepper, and about 1 heaping tablespoon of Italian seasoning. Don’t crowd the pan. Cook in two batches if you do not have a large skillet! 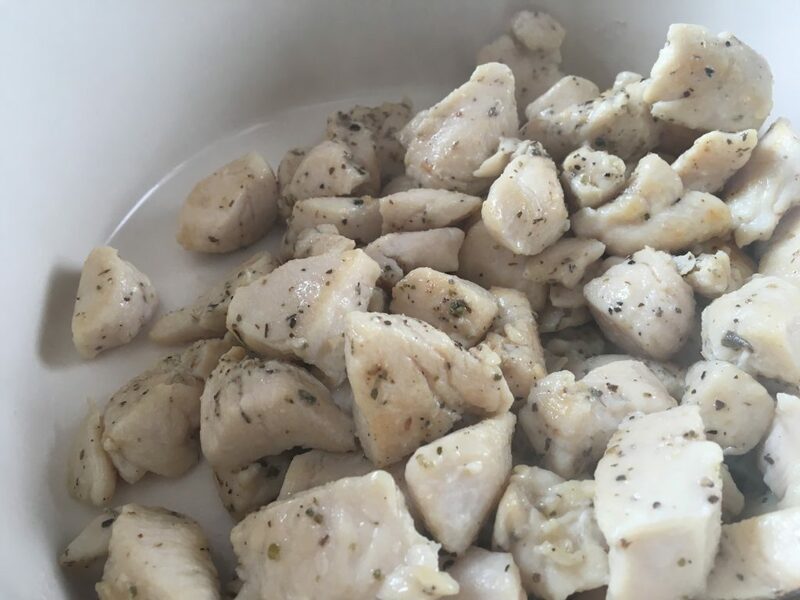 Cook smaller “bite size pieces” over medium-high heat for about 5-6 minutes, flip the chicken from time to time with a spatula, remove from pan, and let the chicken rest for a few minutes! I cook them until they are just on the verge of being completely cooked. The chicken will continue to cook for a few minutes after taking it off the heat. I questioned this for entirely too long before I finally gave in and believed it. Trust me, it’s true. 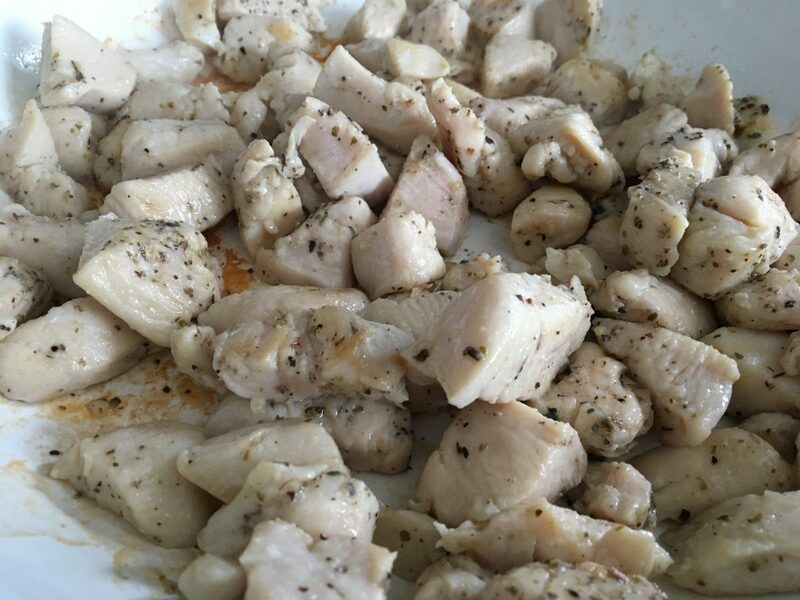 If unsure eyeball the largest looking piece of chicken, remove from pan, cut open, no pink? alright remove it all from the pan and let it all rest. I put right into the casserole dish. No need for extra bowls or dishes here! 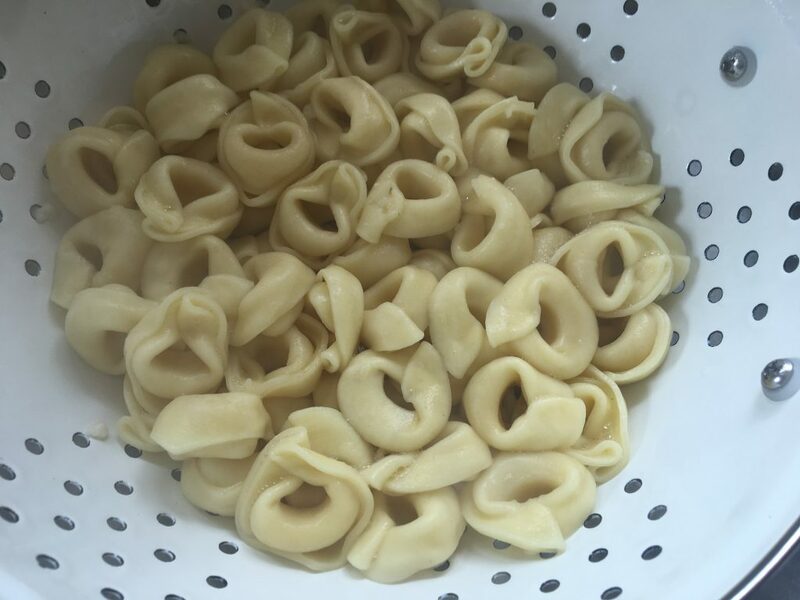 Add your frozen cheese tortellini to boiling water. It should only take 3-4 minutes, but follow the package directions. Strain those perfect little cheese filled bites of pasta! Mix it in with your chicken. Top with some marinara and pop it in a preheated 375 degree oven for about 10 minutes or until the cheese is nice and melted. It’ll look something like this, mmmm… so good. 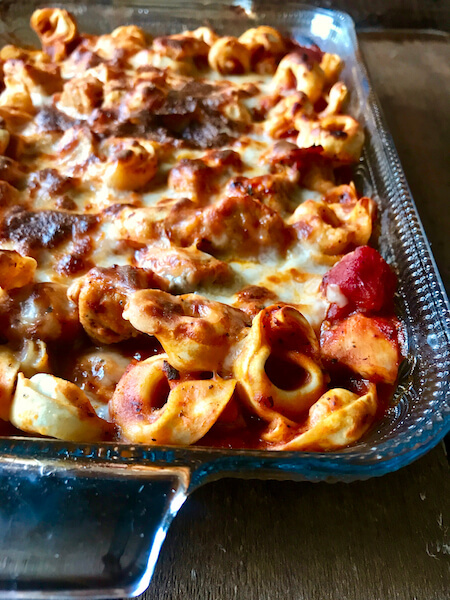 It’s simple and perfect for those nights you’re craving a big ol’ bowl of cheesy pasta, which is almost every night for me. I just love this recipe and I hope you do too! Preheat oven to 375 degrees. In a large skillet heat vegetable oil and then add the chopped chicken. 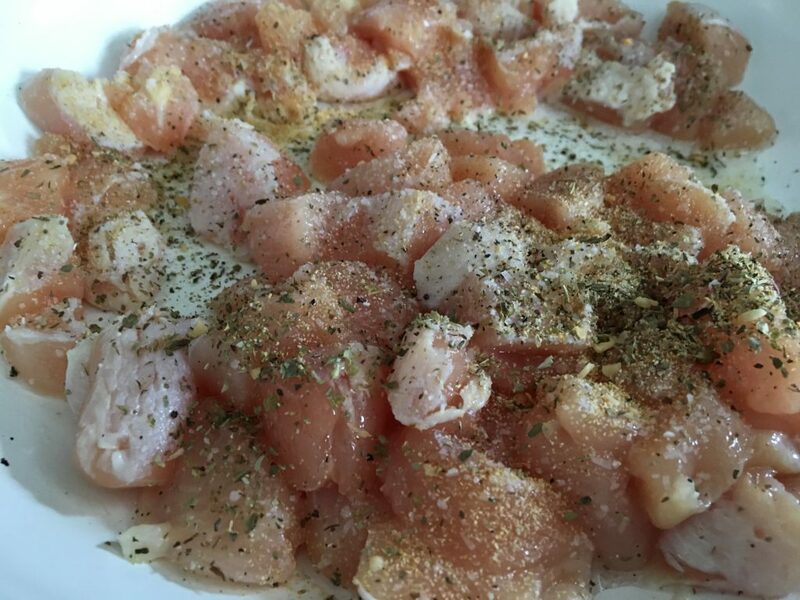 Sprinkle chicken with Italian dressing, kosher salt, and pepper. Cook for about 5-6 minutes until chicken is just done remove from pan and set aside to let it rest for a few minutes. 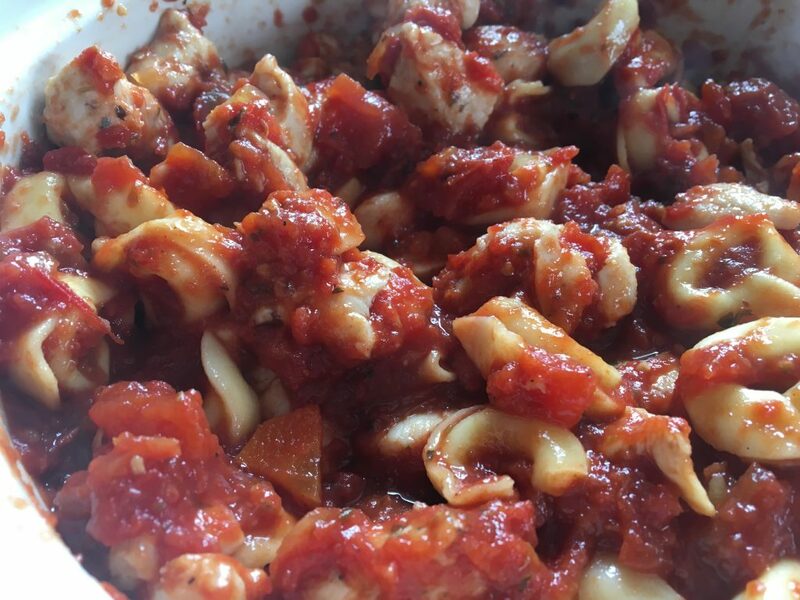 Boil tortellini according to package directions, strain, add it to the chicken, followed by the all of the sauce. Place into a lightly sprayed casserole dish and top with mozzarella cheese. That's it! 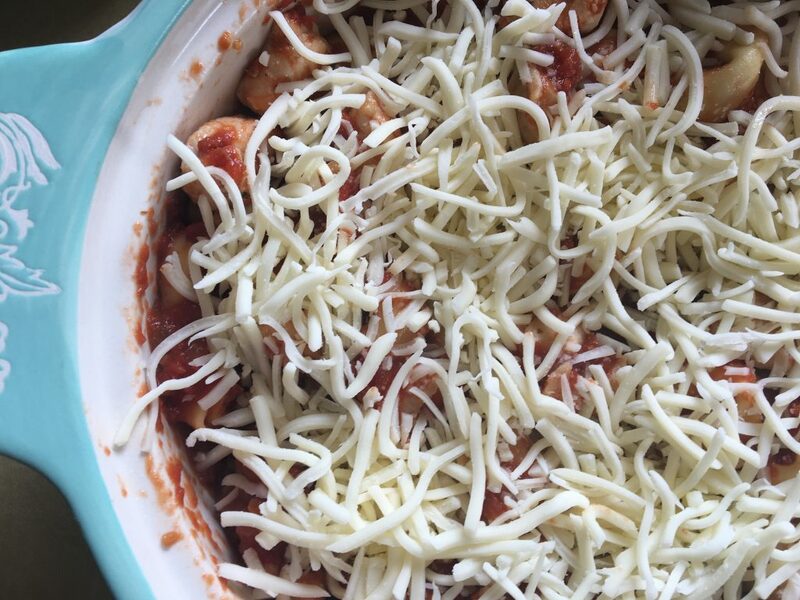 Place into the oven and bake for about 10 minutes or until the cheese is nicely melted. Note: If marinara is cold. You will need to either heat it up in a pan before putting it into the sauce or bake it for a little longer. *If using a jarred marinara the points and calories are subject to change. 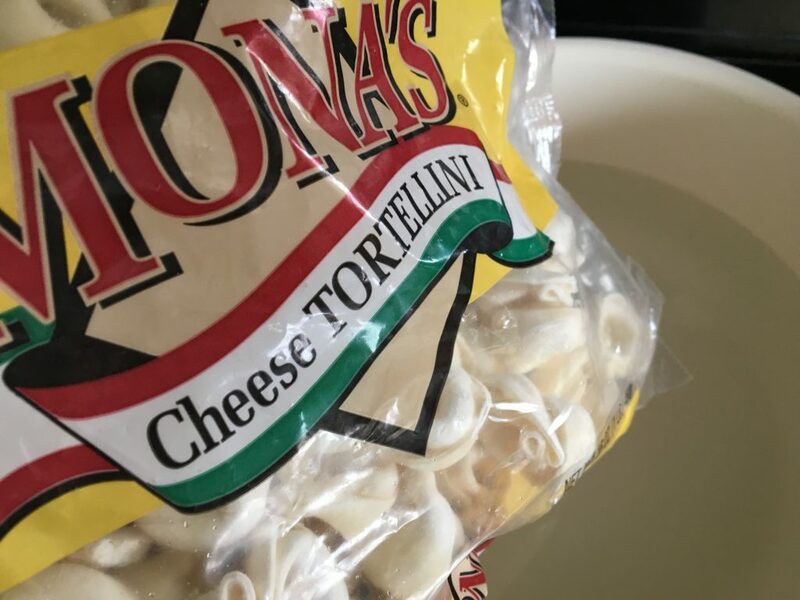 Does dry tortellini work the same as long as it’s 16 oz total? Can you tell me how you would add zucchini to this recipe? Shredded or chopped and how much. You continue to out-do yourself! Love your recipes! 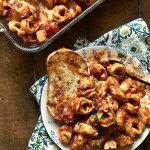 My husband doesn’t typically like pasta dishes but he loved this with your marinara. so good!! I am going to make this for a friend who just had a baby! What would the reheating directions be from the fridge? I’m not going to freeze it — but it will be cold! I assume just increase the baking time?! Thank you!!! I would just heat for probably about 15 minutes longer and make sure to cover with foil. I hope she enjoys! 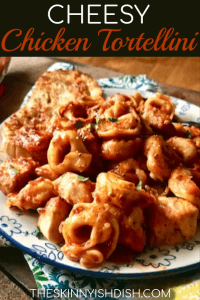 This sounds yummy I love quick family-friendly weeknight meals! FYI In the step where you add the cheese, you say “top with marinara” instead of mozzarella. Thanks! I’ll edit it! Hope you enjoy! Are you using the Weight Watcher’s recipe builder to calculate the smart points? I cannot get mine to come up with 9 smart points. I use the recipe builder. It could just be that different brands of food can have different point values, but I will double check my calculations to be safe! What size casserole do you recommend? 9×13? Hoping to try this week! I have a package of Trader Joe’s Mini Ravioli with cheese filling, If I made 4 cups cooked as recipe calls for the tortellini, do you think that would be a fair trade as far as points go? I should add, the bag is also16 oz, which maybe would be equivalent b/c its pasta vs pasta? Is it possible to use some of your shredded chicken that I have in the freezer in this or does the chicken need to cook from raw? I personally like it with the fresh chicken more than the shredded chicken, but it can totally be substituted! 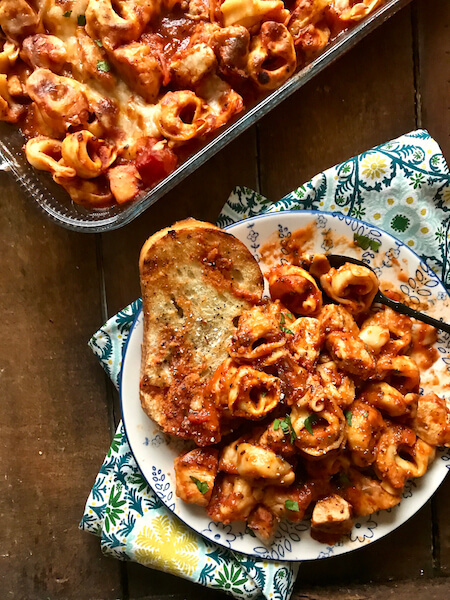 I have some fresh cheese tortellini in my fridge that I need to use this week, so I’m so glad you created this meal! 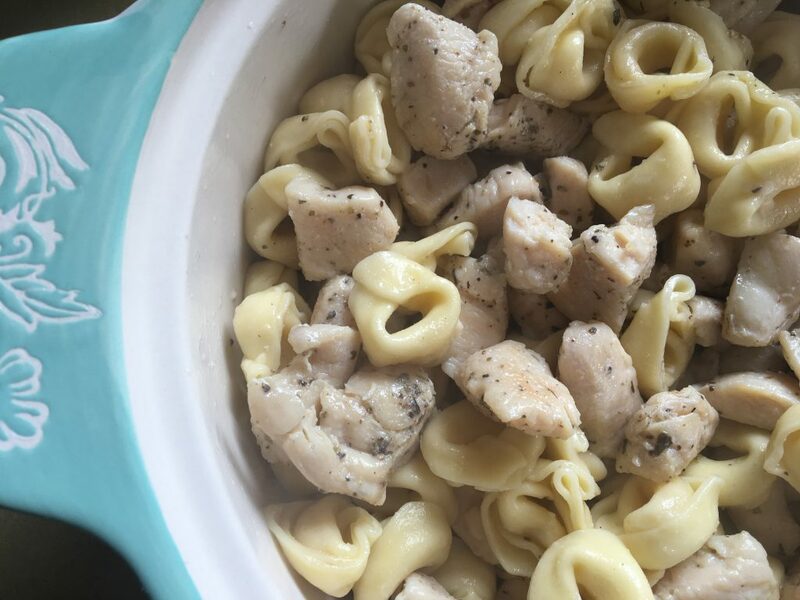 Can I use fresh tortellini instead of frozen? Thanks for creating delicious recipes! Of course! Just make sure it’s about 4 cups/16 oz! =)Enjoy!